As expected, the all-new Lexus ES looks a lot like the LS. After , Lexus has lifted the wraps off the all-new ES midsize sedan at the Beijing Auto Show. As we saw in , the seventh-generation ES takes its cues from the LS and LC, with sharp styling and the same massive Spindle Grille that’s been dividing opinion. Compared to the outgoing model, the new ES is larger but looks a lot sleeker thanks to its lower roof giving it a coupe-esque profile. Underpinning the mid-size sedan is Toyota’s new Global Architecture-K platform, resulting in a weight loss thanks to the use of more high-strength steel. 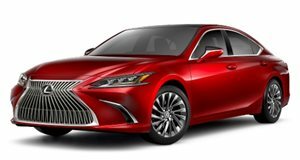 The new platform has also given the sedan a growth spurt: Lexus says the 2019 ES is 2.6 inches longer and 1.8 inches wider than the outgoing model, while the wheelbase has been extended by two inches. Like the previous model, the 2019 ES will available in two flavors: the ES 350 and the 300h. Powering the ES 350 is a 3.5-liter V6, which has had a power increase up to 302 horsepower and 267 lb-ft of torque. That’s a hefty upgrade from the previous-gen model, which produced 268 hp and 248 lb-ft of torque. The V6 unit is mated to a new eight-speed automatic gearbox replacing the old six-speed unit. As before, the new ES is also front-wheel drive only, though an all-wheel drive version is rumored to be in the works. As for the 300h, the hybrid version is more fuel efficient thanks to an updated powertrain featuring an all-new, more compact nickel metal hybrid battery, a smaller electric motor, and an all-new 2.5-2.5-liter Atkinson-cycle inline-four engine. This setup provides a total output of 215 hp, up from 200-hp in the previous model. Fuel economy has also increased to 44 mph combined. New to the ES range is the addition of a new F Sport trim for the ES 350. The sportier model retains the same 3.5-liter V6, but features more aggressive styling, a rear spoiler, and adaptive variable suspension. Also exclusive to the F Sport is a Sport+ mode for the Drive Mode Select system, which engages the most responsive engine, transmission and suspension settings, and an Engine Sound Enhancement feature that "adds an additional layer of engine noise that enhances the natural rhythms of the spirited driving." Inside, the design cues from the LS continue. The new ES features a 12.3-inch infotainment screen dominating the center stack with Remote Touch touchpad control, as well a new Rich Cream interior upholstery option. The 2019 ES is also the first Lexus to get Apple CarPlay at long last, and also comes with Amazon Alexa integration and an optional built-in WiFi hotspot. It’s a far cleaner, more technically advanced cabin than its predecessor’s. As standard, all ES models will be equipped with the new Lexus Safety System+ 2.0, which features a new daytime bicyclist detection as part of the Pre-Collision System. Pricing for the 2019 Lexus ES will be announced closer to the car’s launch in September.